I’m back! Having just landed back to earth after TEN days of silent meditation in Hereford, I’m eager to spill the beans. Yes, I was on a Vipassana meditation course and my, my, was it tough but with mindfulness, consciousness and awareness being such hot topics right now, it’s more relevant than ever to learn what we can learn from these ancient practices. If you’re not familiar with a Vipassana, it’s an ancient form of meditation (thousands of years old) which aims to ‘purify and quiet a chattering mind’ and by doing so, you can learn to become resilient to the ups and downs of every day life. The meditation is guided through Goenka’s audio and video recordings. The teaching is about sharpening the mind’s awareness with the ultimate aim of remaining ‘equanimous’ – in balance – to both negative and positive experiences. It’s not about suppressing emotions, it’s about observing them, watching thoughts come and go, and not being affected by them. This meditation practice teaches us to be mindful that positive and negative experiences come and go so craving the positive and feeling averse to the negative can only lead to unhappiness. Best to stay neutral and feel balance in mind at all times. A tall order I know! I’d heard it was hard, but how hard can hard be? I quickly discovered it was no walk in the park – or a bundle of laughs for that matter – it was like a long-distance mental endurance test, every single day. It was even harder than the marathons I’ve run. Apologies in advance if revealing my experiences spoils it for anyone. I know one of the key reasons the week is spent in silence is so that no one discusses and compares their experiences. What each person goes through is very personal and unique so please bear in mind this was my personal experience and not necessarily what others went through. The RULES: The ten days of no talking, gestures or touching. No books, pens, phones, music, gadgets, cameras or exercise (including yoga) and no religious practices, rites or rituals. Men and women are separated to also avoid distraction. The gruelling timetable featured a grand total of THIRTEEN hours of meditation a day. We were also governed by the gong, with the first dreaded gong waking us at 4am and the last one that signals bed time goes at 9pm. Every night I was out like a light by 9:30pm. Apart from the lunch hour and breakfast hour, there was no other activity scheduled apart from meditation, simply because continuous practice is thought to be the route to success. So we meditated, hour after hour, after hour, after hour. I don’t want to spoil it too much for people who want to do the course so I won’t divulge too much about the technique or the experiences during meditation. We were looked after so so well. I think people imagine a Vipassana is a cold and lonely experience where you’re thrown into a dark room to contemplate life for ten days. That couldn’t be further from the truth! We were fed amazing veggie/vegan food and the accommodation was clean and comfortable and always heated up to the max, especially comforting when it’s November and blowing a gale outside. Staff include past students and volunteers, all AMAZING and the meditation hall is so warm and cosy and decked out with all the cushions, blocks and blankets you could need. 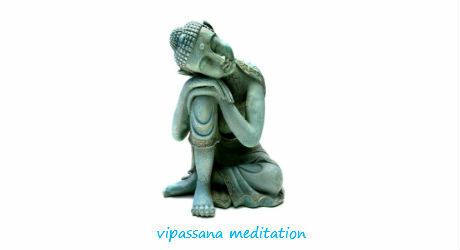 There will be many moments and days of despair but these comforts really really do help so well done team Vipassana. DAYS ONE – TWO: it didn’t take long to start asking myself why on earth I was here. How was I going to get through these stupendously long and boring hours and days? A shell-shocked glaze had rapidly fallen on everyone’s faces as the full extent of the never-ending timetable was sinking in. People were falling asleep left, right and centre during meditation – heads rolling, bodies jerking and the sound of snoring drifting across the main meditation hall. We were all so unaccustomed to this! DAY THREE: we’ve been observing our breath going through our nostrils for three days now so everyone was slightly confused. The aim: to quiet a chattering mind. That’s enough reason for me so I kept going. But at one point I sneaked a peak to look around the room and saw strained faces with eyes shut tight, searching for the meaning of life. It almost felt like some kind of gigantic joke! DAY FOUR: the routine slowly started growing on me and faces around the hall seemed lighter. For the first time I felt like a small weight had lifted and I smiled inside as a new twist to the technique was taught. For the first time also, my mind stopped resisting to the regime and it did in fact quieten down a little. Nice. DAY FIVE: the new technique hurts! For three hours of each day we spent in ‘Strong Determination’ which means no moving and full concentration on resisting any pain or sensation. No craving to the pleasant sensations and no aversion to the negative sensations – this is the key concept to Vipassana which we’re meant to apply to real life. DAY SIX: I’m certain athletes, triathletes, marathon runners and ironman competitors would benefit from this practice. Mentally, it’s one of the hardest things I’ve ever had to do but provides great mental endurance training. It was like running an marathon every day! Occasionally tears flooded my eyes from the pain of sitting in Strong Determination but obviously I was determined to get through it. DAY SEVEN: I felt like I’d turned a corner and my emotions (in and out of meditation) starting balancing, finally! I looked around again and people looked so cosy in their meditation spots. Some had built huge sofa-like constructions, with multiple layers of block, cushions and blankets. It was hilarious to watch. DAY EIGHT: uh oh, boredom kicked in! Having felt like I’d sorted my life out, found a new career, fixed my relationship and balanced my mind, I felt ready to go home. What? I have to stay another THREE days? Cripes!! DAY NINE: I felt like I was climbing the walls with frustration as minutes felt like hours and the hours felt like days. Everything was annoying me and I had no ‘equanimity’, patience or compassion left in me. I was desperate to go home. The only thing that kept me going was the fact that Noble Silence would be lifted at ten am the following day, hoorah! DAY TEN: I woke up ecstatic! I even hummed in the shower with a cheery glow inside and counted down the minutes until we could talk again. I’d been dreaming of this day all week! The teachings of S.N. Goenka are hugely positive and inspiring. Each video and audio recording left everyone with a rosy, warm glow and a new, more harmonious perspective on how to live life. When ‘Noble Silence’ was lifted, everyone hugged and cried – it was an emotional week and the (silent) bond you create with people is strangely strong. There were also two pregnant girls there who were a massive inspiration to us all. Could this be a new trend for expecting mothers? Hi there, excellent post and thank you for sharing. I just had to cancel my invitation to a Hereford retreat this February but am hoping to attend one in April instead. On a separate note, your blog got me thinking, and I wondered whether I could ask you a rather left-field question? I am currently training as an actor and one of the key aspects of my training is in developing the ability to allow oneself to be emotionally affected by another person’s remarks, or to put it another way, to take things very personally. This is all part and parcel of allowing one’s true impulsive feelings to play out, thus conveying what is considered in acting terms one’s ‘truth’. My question, if you would be so kind as to offer a response to what has been a rather perplexing issue for me, is whether or not you think the teachings of Vipassana are in any way in direct opposition to that of my current actor training? Hi thanks so much for posting, that’s a great question! It’s a common misconception that meditation is a way of supressing emotions – that’s far from the truth so it definitely wouldn’t be in conflict with your training. It’s about observing what’s there to increase awareness and simply watch the emotions, whatever they might. It’s learning that all feelings (good and bad, happy and sad) are transcient and ever-changing. A regular practice should strengthen awareness which I think could in effect help your actor experience more than hinder. Imagine how powerful it would be if you were tuned in to the minute changes of your mood and feelings without reacting to them. It can make you feel very grounded and in control. For me, attending a Vipassana was not life changing but more of a one off experience led by curiousity but it was one piece in the ever evolving journey to greater awareness development (or mindfulness as most call it). Since then I’ve practised simple but effective meditations through my weekly hatha yoga classes (classic and very slow). So if you’re interested in cultivating deeper awereness I would recommend committing to some simple breathing meditations (where you watch the movements of breath through your body – I wrote a post about this so do check it out) or external meditation (like meditating on sounds which is a lovely experience) before or after your V.
I am going to do this after a week and your blog gave me a good idea on what to expect. I am an absolute novice but doing it as it comes highly recommended by friends who have done it. A question about the accommodation (i know, superficial) – are there individual rooms or is it shared acco. I will be going to Dhamma Dipa in Hereford. Cheers! Sounds amazing… I’m planning on doing one in India in December. Only began meditating in earnest about six months ago, only for 30 minutes or so a day, but the change in me has been profound. I am curious about your re-entry ! Having done a number of week long silent yoga retreats I have found that the process of ‘bridging’ from the intensity of these personal/spiritual experiences back into normal, everyday life difficult and challenging – so much so that I stopped doing them! I found I was unable t keep the discipline and focus and was ricocheting like mad between different modes of being ! How did you find it? How had the experience changed you and how did you reconcile this with your life? Have you found a balance? Hi Lisa, that’s a really interesting question. I have done several retreats now (of varying intensities) and come to realise it’s best to adopt elements to improve everyday life/wellbeing. I agree, it doesn’t take long to revert back to normal ways but I don’t think that’s the point. The point isn’t to change who you are or change the way you live – it’s more about enhancing and improving your approach to life, and your actions/reactions to things. Also I see these retreats as a way of recharging once/twice a year to regain clarity and perspective. When I return, I don’t try to mould and benchmark myself against various disciplines (such as meditating 1hr a day like the Vipassana retreat tells you to do) but I end up cherry picking what’s realistic to adopt and what works / resonates with me – e.g. a short 5-10 min meditation at the end of the day a few times a week and a longer one at the weekend. I guess these experiences become like a toolkit to life. A rather long reply, I hope it kind of answers your question?! I have just noticed this blog and it sounds fascinating! Well done! May I ask how you felt about you beauty routine. I would imagine meditating change some desires in our daily lives. I would be interesting to hear back from you. Absolutely agree on getting back to basics and with minimal fuss! I would have done the same and I would have imagined that a meditation course like this would also trigger a change in beauty. I wonder with how many bags though did the rest of ladies leave ;-)) Love the rose oil that you mention. What I see from our clients is that they seek for less mess but honest ingredients, that’s why we allow them to even choose their own blends of essential oils & create their very own unique cream. Let’s keep in touch. Great blog! Judy – I was a begginner! I went having never done more than five minutes of meditation in my life. But the instruction and guidance is so well presented (by the don, S.N. Goenka), that you never feel like you don’t know what you’re doing. Even if you’ve meditated before, the technique is slightly different to other forms (eg. visualisation) that everyone is in the same boat. I don’t feel different day to day but the teachings have stayed in my mind and i think about them. I feel lucky I’ve been able to experience such a positive philosophy and way life. Unfortunately they expect you to carry on meditating (for two hours a day!) to continue to feel the benefits, which is quite unrealistic. The course also gets a lot of repeat students…Definitely for anyone who has the will power! Haha.. maria – the aim of the first half of the course is to quiet a chattering mind and by day two I thought my brain would never shut up! But low and behold, by day four things started to getting quieter up there.. unbelievable how much training your mind needs to just be quiet! Emotions came and went and I shed a tear (or two!) pretty much every day. Time went by slowly yes but when else would I get to be silent for ten days at any other time in life?! so I just tried to relax and learn from the teachings. Renewed and clear minded at the end? A little. Very happy though – we were all on a high after so many ups and lows! Wow Yan, sounds amazing and a nightmare all in one. Not sure if i’ll be doing one, tho it’s been on my to do list for years…thanks for the insight.